There are just two weeks left of the MLB regular season and the wildcard battle in the National League is intensifying. The San Francisco Giants started the year with great expectations and before the all the star break they were well on course to play in the post season but they fell out of grace in the second half of the year and have struggled to regain their mojo since, they are still in the wildcard race but their lead is small and fragile. The New York Mets are right on their heels and seem to be doing better than the Giants, they have won 7 out of their last 10 games, although they did lose on Wednesday, still they are pretty much guaranteed a wildcard spot with only 16 games left to play and all of them against teams who don’t have a winning record. The other team that is currently not in the top two but is so close it could overtake either the Giants in these next two weeks are the St. Louis Cardinals who are only 1 game behind. Much like the Giants at the beginning of the season the Cardinals were expected to make the post season as they have almost every year, but their inconsistency has pinned them into a life or death situation of sorts. The Cardinals will travel to San Francisco for a 4 game series starting today, and given how close the two teams are this series might become the deciding factor into who gets to play in the post season. The Giants main problem has been their rotation, their combined ERA for this month is 4.24 which in all reality is not good enough to push them into the post season. Even with their two top guys, Madison Bumgarner and Johnny Cueto they have not been able to get back in the game. However, with the addition of Matt Moore, manager Bruce Bochy, hopes he can produce a series of solid starts that will turn things around enough to secure his team a spot after October 2nd. The St. Louis Cardinals are relying on 35-year-old Adam Wainwright, who is considered by many to be the heart of the Cards, to help them get through these last 17 games and into the post season. Wainwright has an ERA of 3.18 when playing at AT&T Park, home of the SF Giants. Offensively the Cardinals were one of the top teams in the first half of the season with an average of 5.2 runs per game, in the second half of the season they are down to 4.4 per game. But Matt Adams has a great record against Cueto and that could make the difference in this series. Given the remaining schedule for these two teams, I give the Cardinals a slight advantage and I predict the wildcard final will be between the Mets and the Cards. 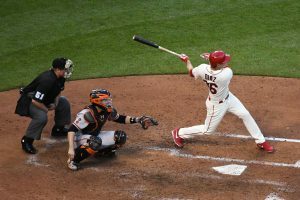 Don’t miss out on these last two weeks of MLB games betting lines and odds, head on over to Ace Sportsbook and place your last bets of the season.